I had completely forgotten that Aurora is in Hamburg for her refit. 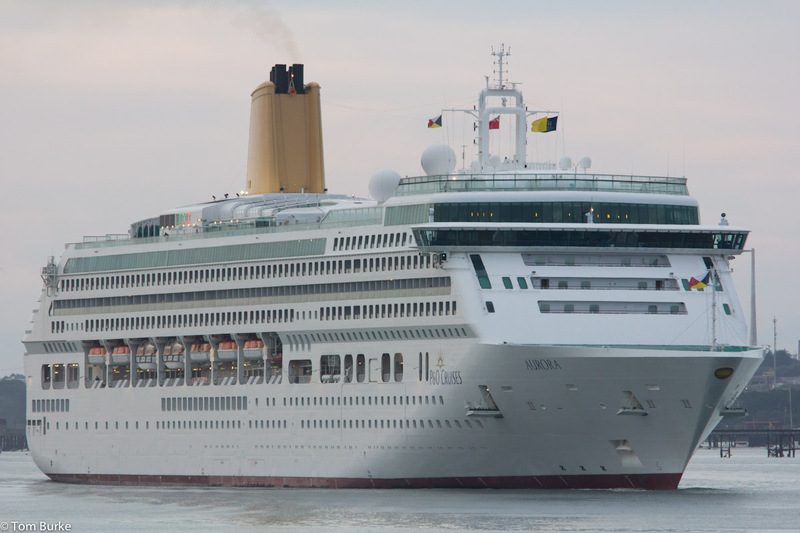 In fact she’s been there for almost two weeks and will be returning to Southampton in just a few days – Southampton VTS has her returning to Southampton on 17 December and departing on 19 December on a two-nighter to Zeebrugge followed by a 14 night cruise to the Canary Islands on 21 December. (This means we’ll pass her on Arcadia on the night of the 20th as we head off to Zeebrugge, but I suspect the Channel Traffic Separation scheme will mean that we’ll be miles apart.) The headlines for the refit seem to be about the new livery – the hull art and new funnel colours – followed by the creation of a Glasshouse, other dining venue changes, and various areas being refurbished. Here’s a link to a P&O page giving details. And here is a link to a webcam in Hamburg harbour more or less opposite the Blohm + Voss dry dock where the refit is happening. The cameras seems to be a cycle of movements so you may have to wait until it pans across the scene just across the river. There’s also this YouTube video taken from a boat on the river Elbe, and showing good close-up shots of Aurora in the dry dock, Fred’s Balmoral (also in dry dock) and a long section passing back and forwards alongside Artania, the former Artemis and original Royal Princess. Phoenix Reisen seem to be looking after her. As I type she’s sailing through the English channel so I wonder if anyone will get some video of her coming into Southampton, I’m interested to see how she looks now. We’re booked on her for Xmas 2015 which is a similar to your imminent cruise so I’m also very interested to here how you get on and I hope you enjoy yourselves. THere’s a good image of her in the Elbe on the P&O website. Here’s a link.